Since you are completing this application yourself, you must check box 1a. 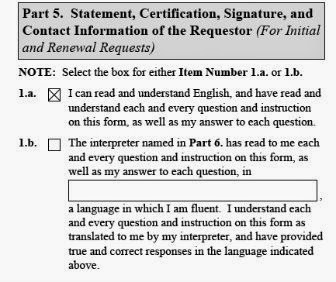 Only an interpreter will check box 1b. 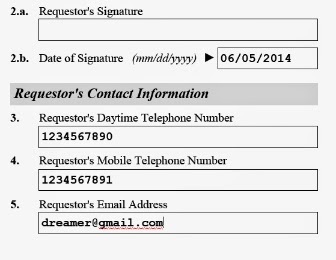 You must also sign and date in 2a and 2b as the requestor. In 3, 4, and 5, provide your contact information like a daytime phone number, a mobile number, and email address so that USCIS can contact you (they rarely call and you should always make sure that you are not dealing with crooks who impersonate immigration agents) but they are known to send text messages about the status of your application. Part 6 and 7 will be completed by interpreters and preparers and DIY DREAMers can leave it blank.